We all know what it is; we just don’t know what it’s called. I’m referring to a clapperboard or clapboard. If you’ve ever seen a movie in which they’re making a movie, you’ve seen a crewman go something like, “Scene twelve, take three,” and then he holds up the clapperboard and the director yells, “Action!” That’s a clapperboard, as iconic a piece of movie making as you can ever hope to find. The reason for the clapperboard was two-fold. First, it recorded all the necessary information such as the director, date, and scene being shot and, second, the “clap” was used to help synchronize the sound. 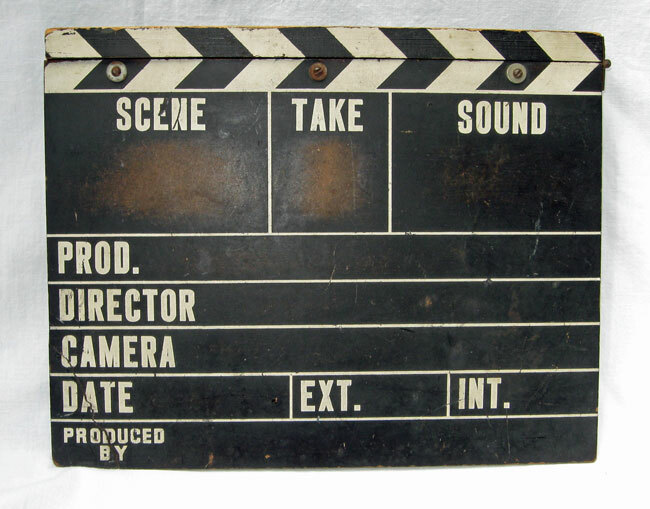 Reproduction clapperboards can be found just about anywhere, especially at souvenir shops in Hollywood or at Universal Studios theme parks. They’re not very expensive or you also can buy one of the many fakes on the internet. Finding a real one is a little more difficult. On my most recent flea market adventure to Pennsylvania, however, that’s just what happened, and for thirty bucks I am now the proud owner of my own authentic movie clapperboard – something I didn’t even know I wanted to own! Just looking at this object I could tell it had been well used. You could see wear to the black paint especially where the “scene” and “take” would have been changed many times during filming. A chunk of the corner had also broken off and been re-glued. Had this been damaged on the set and thrown away only to be taken home as a souvenir? That’s an intriguing possibility. 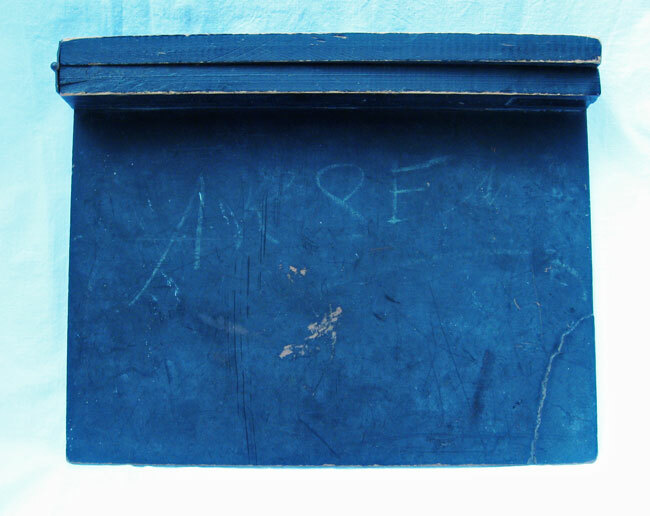 Even more intriguing were the letters written on the back. Obviously written long ago and now faded, the letters A R S E N appear. When I got home, I quickly went to my computer to check the “Internet Movie Database” website (www.imdb.com). I typed ARSEN in search and very little popped up. I quickly ruled out Arsenio Hall as he probably wasn’t even born when this thing was made. The only other possibility seemed to be the title of the movie “Arsenic and Old Lace”. Based on the very popular Broadway play of the same name, the movie “Arsenic and Old Lace” was made by Warner Brothers Studios in 1941. It wasn’t released, however, until January 1, 1944 due to the fact that the studio had to wait until the Broadway production had ended. It was directed by Frank Capra, who is probably best known today for making “It’s a Wonderful Life,” the Christmas classic. It starred Cary Grant as the nephew of the two old maid aunts who kept bumping off elderly bachelors by poisoning them. Can I prove beyond a shadow of a doubt that my clapperboard may have once found itself between Frank Capra and Cary Grant, two giants of the golden age of Hollywood? Well….no, but the circumstantial evidence is strong enough to make a case for it. Plus, I can’t think of any other logical reason to write “ARSEN” on it. Do I believe it was used in the production of “Arsenic and Old Lace”? Yes, I do. Even if it wasn’t, it is still an authentic piece of Hollywood history that was used in movie production. Not a bad day at a Pennsylvania flea market. This entry was posted in 1940's, Americana, Jim, Uncategorized. Bookmark the permalink.